Social media pushes thousands of images across my visual field daily. 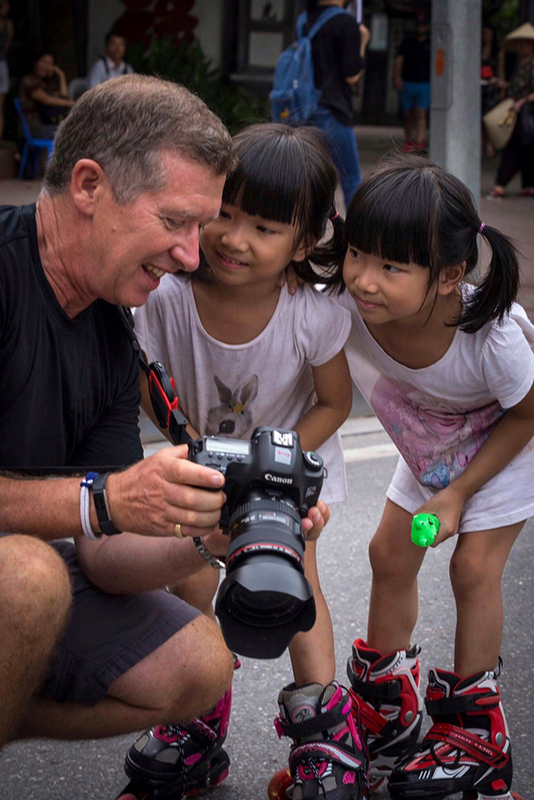 Why am I stopped in my tracks by a photograph taken recently by Gavin Bowyer that captures a pair of the cutest smiling twin girls on roller-blades in Hanoi? I study it minutely. I return to it. I download it. I show it to friends. I decide to talk about this beautiful stuff. The photograph is beautifully composed and would have been very difficult to stage. The scene is set in a road but there are no cars or bicycles. An ignored pedestrian crossing gives space between the twins and the backdrop of out-of-focus people, trees and buildings; this gives an impression of social distance or even separation. The delightful and delighted twins set up a sort of symmetry tangled up by their arms and their heavy plastic-metallic footwear. Their matching black hair-dos quad the black of the roller-blades. The bright red of the roller-blades picks out the pinks of the motif on the right twin’s t-shirt, their lips and some muted reds in the far background. The bright machined metal cluttered around the twins’ unsteady feet contrasts with pretty much everything in the picture especially their bare legs; their legs, in turn, stand out from all the legs in the backdrop. Bravo Gavin! Good eye! At first pass, this is an accomplished photograph that is at the same time very, very cute especially as the clinging twins seem so happy to be photographed. Gavin has established a rapport with them. But what I admire more about this photograph is that it generates so many questions. Are the twins clinging to each other for stability on their roller-blades or did they simply grab hold of each other in a fit of twinsome giggles when the attention of a westerner with a big camera was turned upon them? There are no obvious scratches or bruises on their knees or elbows. Is there a parent or older sibling out of field who has held their hands to prevent them falling? Why are they not wearing helmets and protection for their elbows, wrists and knees? Is this because the family is too poor? Or are the two of them simply expert roller-bladers? They seem so happy but maybe they are street children who have worked out how to appeal to and pose for snap-happy tourists? (The possibility of their being orphaned or abandoned is visually accentuated by all the background adults walking away.) This sets up a darker reflection. Are our little not-so-street-wise roller-bladers vulnerable to much, much more than scratched knees? I find that the longer I look at this totally compelling photograph, the more questions arise and the more I move from being charmed to being intrigued or even concerned. I started by admiring a twin-portrait photograph and end up wanting to know the story of its two subjects. The last question I find myself asking is: Who else thinks this is a perfect photograph? Whoops! I originally attributed this photograph to Roger Clark. It turns out that the talented image-maker is Gavin Bowyer photographed here by Roger Clark with those adorable twins.